A dog may be man's best friend. 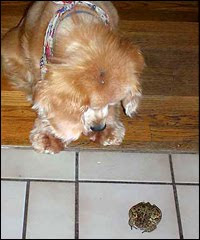 But one dog, Lady, decided she needed more friends -- and she found plenty in the knot of toads living at the local pond. A suburban family's secret struggle with an uncommon addiction comes to light in this personal essay by NPR's Laura Mirsch. Lady "was really perky, and happy, and generally excited to see you when you came in the door every day," recalls Andrew Mirsch.